After this there was a feast of the Jews, and Jesus went up to Jerusalem. Now there is in Jerusalem by the Sheep Gate a pool, which is called in Hebrew, Bethesda, having five porches. In these lay a great multitude of sick people, blind, lame, paralyzed, waiting for the moving of the water. For an angel went down at a certain time into the pool and stirred up the water; then whoever stepped in first, after the stirring of the water, was made well of whatever disease he had. Now a certain man was there who had an infirmity thirty-eight years. When Jesus saw him lying there, and knew that he already had been in that condition a long time, He said to him, “Do you want to be made well?” The sick man answered Him, “Sir, I have no man to put me into the pool when the water is stirred up; but while I am coming, another steps down before me.” Jesus said to him, “Rise, take up your bed and walk.” And immediately the man was made well, took up his bed, and walked. And that day was the Sabbath. The Jews therefore said to him who was cured, “It is the Sabbath; it is not lawful for you to carry your bed.” He answered them, “He who made me well said to me, ‘Take up your bed and walk.’” Then they asked him, “Who is the Man who said to you, ‘Take up your bed and walk’?” But the one who was healed did not know who it was, for Jesus had withdrawn, a multitude being in that place. Afterward Jesus found him in the temple, and said to him, “See, you have been made well. Sin no more, lest a worse thing come upon you.” The man departed and told the Jews that it was Jesus who had made him well. It is apparent that, despite the hardship of physical infirmity, the greatest emphasis of well-being concerns the state of the soul and not of the body. The physical pain and suffering we endure in the current life does not equate to the importance of the lifting–up of our hearts and minds to God. 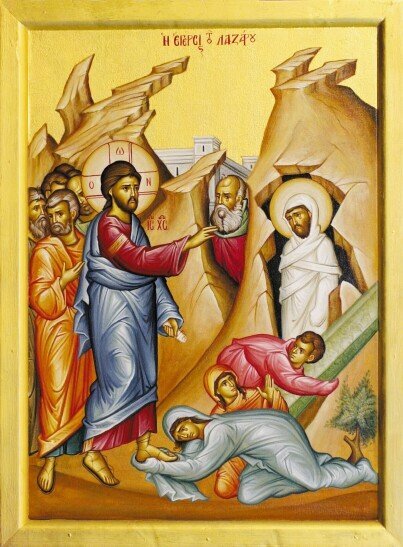 Jesus Christ instructs the newly–healed man to “Sin no more, lest a worst thing come upon you.” What is worse than being paralyzed for 38 years? Spiritual paralysis!As the paralytic, we need to ask Christ to heal us of the paralysis in our lives—the paralysis that keeps us from moving closer to Him! Recent excavations in Jerusalem have unearthed this pool, used for cleaning the sheep to be used for sacrifice at the temple, including its five porches. Certain Fathers of the Church equate the five porches with the five senses that can act as the doors of the passions, which in turn are the cause of our spiritual sicknesses: taste, touch, smell, sight, and hearing. What happens in this Gospel reading? What does this Gospel passage mean to our lives? The Power of Prayer—Make a list of family members and friends who are in need of prayers. Also, check with your parish priest for additional names to be included. Make a habit of using this list during your prayer time. Rise and Walk—Look up the definition of the word “paralyze.” As a family, make a list of things that can “paralyze” us in our lives. Discuss how we can heal our paralysis through God—just as the paralytic did in this Gospel. I Have No Man—Many ill and lonely individuals “have no man.” Be a servant of God by visiting and/or helping those who need companionship and help. For example, see if there is a person at your parish who is elderly or has special needs and could use your assistance, either with simple companionship or aiding with a simple household chore. As of old You did raise up the paralytic, O Lord God, by Your Godlike care and might, raise up my soul which is paralyzed by diverse sins and transgressions and by unseemly deeds and acts, that, being saved, I may also cry out: O Compassionate Redeemer, O Christ God, glory to Your dominion and might. Suffering and Salvation by Fr. Vasilios Bakoyannis—This book offers the comfort of God's word and the saints to those who suffer. Available from Light and Life Publishing. Aloysha’s Apple by Alvin Alexsi Currier—Old Russia comes to life in this tale of a poor orphan girl who braves the dangers of the deep forest to find healing for her crippled brother. The poetic text and colorful illustrations draw on their roots in classic fairy tale tradition to tell a story of triumph, faith, and love. Published by Conciliar Press. “Giving Meaning to Suffering” by Fr. Andrew Demotses—Read about how God comforts us in our suffering atwww.goarch.org/resources/sermons/sermonettes/sermonettes082.